60 attendees from 19 cooperatives were present during the MOA signing. Out of the 19 cooperatives, 10 are engaged in rice trading while the remaining nine cooperatives are into other businesses like bakery business, metal fabrication, transportation, and express pay services. Manila Water Foundation (MWF), in partnership with Fundacion Altadis and the Provincial Cooperative, Livelihood and Entrepreneurial Development Office (PCLEDO) of Cavite, assisted 12,318 community-based cooperative members get a fresh chance to a better life through a project collaboration that aims to help achieve sustainable development via provision of non-interest bearing loans and capacity building mechanisms. Through its Kabuhayan Para Sa Barangay (KPSB) program, MWF officially formalized its partnership with 19 Cavite-based cooperatives through a Memorandum of Agreement signing held on August 15, 2016 at the Cavite Cooperative Development Center, Trece Martires City. Each of the cooperatives will get PhP100,000 which they can use as additional capital for their small to medium enterprises. Apart from the loans, they will also be provided with trainings and other capacity-building assistance to help the cooperatives achieve holistic growth. In total, PhP1.9 million will be awarded to said cooperatives whose businesses include rice trading, consumer goods, and transport services. 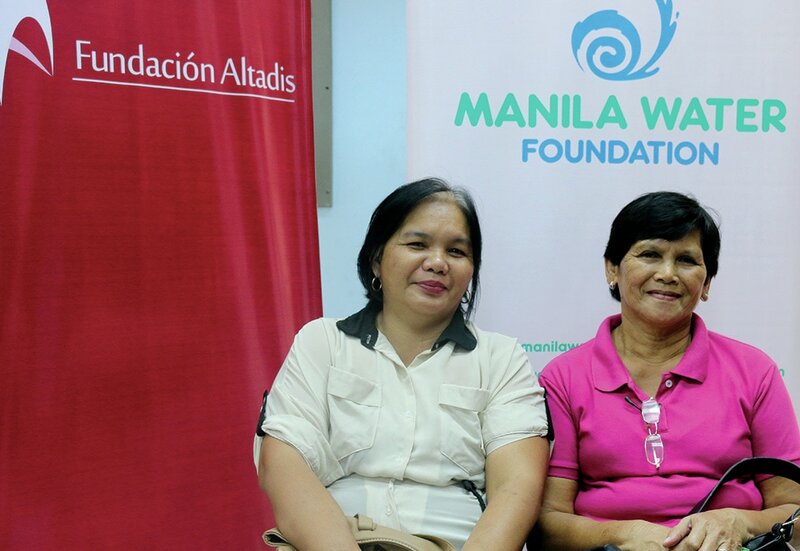 Said amount was raised through a tie-up project with Fundacion Altadis, a Spain-based non-profit organization whose mandate to create sustainable livelihood for countries with great social needs through capacity building and skills improvement is very much aligned with MWF’s livelihood thrusts. During the event, MWF Executive Director Carla May Beriña-Kim expressed the organization’s promise to help attain economic prosperity through nation-building and pointed out how this is very much aligned with the cooperatives’ vision of providing help not only for members and their families but also for the rest of the community. “Kami po sa Manila Water Foundation, gusto naming tumulong sa nation-building. Gusto po namin lahat, simula sa pinaka-simple, aangat po at aangat,” (Manila Water Foundation wants to help in nation-building. We want to see that even the simplest man can one day attain prosperity.) she stressed. 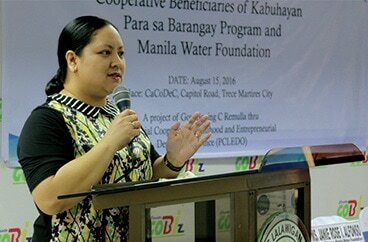 MWF Executive Director Carla May Beriña-Kim expressed the Foundation’s gratitude towards the partner cooperatives and the provincial government of Cavite for their warm welcome and genuine support for the KPSB program. She also reiterated MWF’s commitment to support the cooperatives not only through the soft loan but also through capacity building initiatives. This statement was positively received by the cooperative representatives in attendance like Mr. Vicente Villan, Jr., the chairperson of Greenbreeze Village 1 Multi-Purpose Cooperative, who shared that being a KPSB partner cooperative may just be the break they need to revitalize their business. “Our cooperative is almost dying. Kaya sabi ko nga very timely and very thankful [kami] dahil nung inisip namin na magkaroon ng bakery business nag-offer naman ang Manila Water Foundation ng tulong. [‘Yung PhP100,000], unang-una, makakatulong sa pag-procure ng machinery para sa bakery business at materials tulad ng flour at sugar,” (Our cooperative is almost dying. So we are very thankful for the timely help of Manila Water Foundation which can help us procure machineries and ingredients for our bakery business.) he quipped. To date, MWF’s KPSB program has made it possible for 340 community-based cooperatives, or more than 100,000 families, in the Philippines to operate and expand financially-viable businesses through non-interest loans and related trainings. Greenbreeze Village 1 Multi-Purpose Cooperative representatives were eager to sign the MOA and soon start their bakery business. Partner cooperatives waved the agreements in excitement as they are to receive their soft loan shortly after the signing. Each cooperative will get a Php100,000 non-interest bearing loan to help sustain the capital of their cooperatives’ businesses. PCLEDO Head Officer Alvin S. Mojica (first from left) expressed his gratitude towards MWF for the help they’re extending to the cooperatives in Cavite. He also challenged the cooperatives to work hard and grow the seed money they’ll get from the Foundation. Partners from Bukluran sa Kaunlaran Ng Tinig Multi-Purpose Cooperative gladly shared their anticipation towards the future trainings that MWF will provide to help them in marketing their coco-matting products.